As, so it begins- my boy is reading! He read us a book the other night before bed, blending all the words and getting every one just right. The Hubs and I just sat there and grinned like fools the whole time, so proud that I thought we were going to burst. Sure, this means our time of being able to spell words we don’t want the kids to know is dwindling down, but the upside to this whole Scorch being able to read things is enormous. I hope so much for my kids- including that they the same passion for reading that I do. I simply can’t imagine how boring and stale my life would be without a good book. On that note, the kids are finally asleep (thank goodness– it’s been a crappy day here behavior wise), the Hubs is watching TV and I have a lot of books to enjoy. What are you reading? You know I’m always looking for a good recommendation or two! Both Divergent and Extremely Loud and Incredibly Close are on my TBR list. Let me know what you think! I will Shauna- right now I’m reading the first book in the pile by Marisa de los Santos. I recently finished two others by her and loved them, so I’m hoping this one is as good! 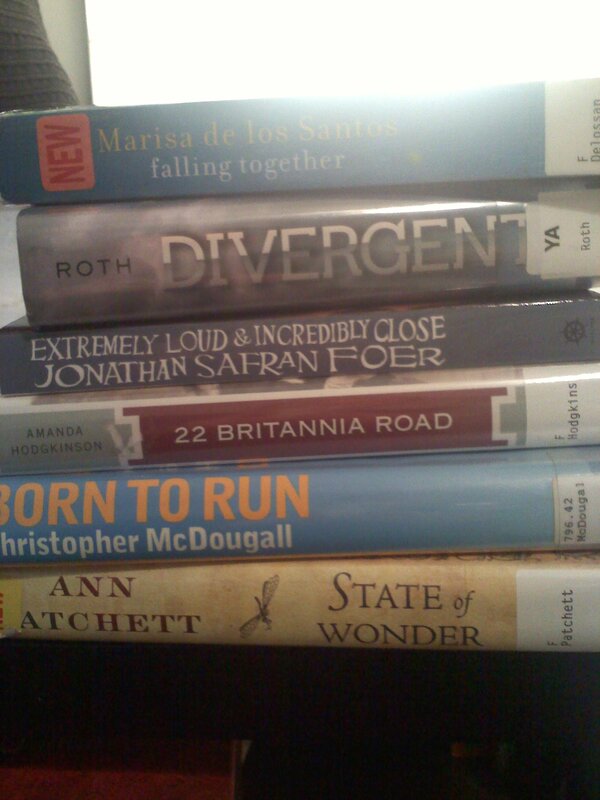 I think Divergent is next on my list as I own Extremely Loud and don’t have to worry about returning it to the library! Congrats on raising a reader, when I have kids I hope they’re as big of bookworms as my fiancee and me are. If you like Extremely Loud, you should consider his other book Everything Is Illuminated, it was a great read and very moving. The book We, The Drowned by Carsten Jensen is also one that shouldn;t be missed. It rates as one of the best books I’ve ever read. Thank you so much for the recommendation! I just added the Jensen book to my list at the library! Some of my recent favs are The Secret Life of Cee Cee Wilkes and The Midwife’s Confession, both by Diane Chamberlain. I’ve just discovered her and I loved both of these! I’m saving all the Diane books for our drive to FL this winter! You and your mom so highly recommended them that I can’ wait to start them! Yay, I love book recommendation posts! I am so thrilled you liked Marisa de los Santos…I am SO bummed when I suggest them and they aren’t loved. I was worried the third wouldn’t live up to the first two but it did not disappoint! State of Wonder and Divergent are on my list too. I just finished one called The Dirty Life by Kristin Kimball; I found it fascinating. Two more I have in my pile are Set This House in Order and The Fault in Our Stars.